Several people I know recently shared this article about ebook piracy. The basic argument, as made by fantasy writer Maggie Stiefvater, is that you shouldn’t pirate books because it jeapardises authors’ livelihoods and hence ability to keep writing. She makes the point that her own Raven Cycle of novels nearly came to a premature end because of piracy affecting sales. The argument boils down to this: if you like something, you should pay for it, so you can get more of it. Now as an aspiring author I’m hardly going to argue in favour of piracy. I am, however, going to commit heresy. Because I don’t actually find this argument that persuasive. Why not? For two reasons. Firstly, because the stuff-for-free genie is already out of the bottle. There is now so much writing available online for free – even without pirated ebooks, there is loads of fanfic, and loads of self-published writers who’d rather give away their writing than keep it in a desk drawer – that many readers have simply become used to getting stuff they like without having to pay for it. And secondly, because paying for an author’s books doesn’t always mean you get more of them. Look at fantasy writers George RR Martin, Scott Lynch, and Patrick Rothfuss, and litfic writer Hilary Mantel. What they all have in common is that they’re currently disappointing their fans by failing to produce the promised next instalments in their respective book series. I don’t want to throw these authors under the proverbial bus – I’m sure there are good reasons for the delays – but the fact remains that paying money for books is not a guarantee that the author will write another one. Here comes the heresy (brace yourself!). If writing really is a business and not a hobby, then shouldn’t writers be obliged to fulfill their end of the bargain? And if for some reason they can’t do it themselves, shouldn’t they subcontract to get the work done on time? What!? Subcontract the creation of a novel!? How can I suggest such a thing? Well, it seems to work for James Patterson. And yes, I know many people are sniffy about the quality of his thrillers, but he keeps his readers happy. And his publishers. And his bank manager. Collaborative works don’t have to be low-quality. One of my favourite books I’ve read this year, The Medusa Chronicles, is a collaboration between Stephen Baxter and Alastair Reynolds, based on a novella by Arthur C. Clarke. And let’s not forget that Brandon Sanderson finished off the Wheel of Time book series after original author Robert Jordan failed to complete it before he died. I’m sure Wheel of Time fans are happier with that outcome than with being left hanging. Co-writing books with more established authors can be a way for young unknown writers to learn their craft and build a reputation, as well as for the established writers to expand their own brand. (Yes, I said brand. I can feel the shudders). Collaboration is so common in the world of TV and film script-writing that it’s amazing it’s not more prevalent in the world of books. And fanfic is now so widely accepted I’m expecting to see more and more of it published under licence. I know, I know, this is all highly heretical. But let’s be honest, authors and publishers need to do something to combat the threat of piracy, and unlike musicians, they can’t really rely on live tours to make ends meet. Whether the future holds more collaboration and licensed fanfic, more Kickstarter-and-Patreon funded books, fewer writers making any money at all, or all of the above, the times they are a-changin’. Writers are, contrary to what you may have heard, only human. As such, we make mistakes. I know I’ve made plenty, and I’m trying to learn from them so I won’t make the same ones again – instead, I’m progressing to exciting new mistakes. 1) Being too fussy about when you’ll write. It’s great to sit down in your favourite spot at a convenient time, with a cup of your favourite beverage, feeling relaxed and inspired and ready to create. The only problem with this picture is that – as I’ve previously found – if you only ever write when time and circumstances and mood are all in perfect alignment, you tend not to write very much. Getting a serious amount done requires a more serious commitment, even if not everything is perfect. In fact, not having everything perfect can actually help avoid that constant curse of the writer, procrastination. If you don’t have much time or you don’t feel quite comfortable or you have a slight headache, that can help you focus on getting the most important stuff done as quickly as possible. 2) Having too many projects. Starting a writing project is easy. Finishing it – once the first flush of happy inspiration has faded – is hard. There’s a temptation to put a project to one side, and start a new one. Now, having more than one thing on the go at once isn’t necessarily a problem – in fact it can be very helpful to keep thing fresh – but if you end up (like me a few years ago) with loads of first-chapters and no finished novels, then it might be time to focus on one thing until it’s done. 3) Taking too long on one project. I’ve also made the opposite mistake: spending years perfecting one thing. A perfect novel is great, but if you’re at all interested in progressing as a writer, four not-quite perfect novels are much better. Like any other work of art, they are never quite finished: at some point, you simply need to stop working on them. This was an interesting mistake, inasmuch as I made it consciously and deliberately because I wanted to concentrate purely on creativity until I’d finished my first novel. Which was fine, but combined with the other mistakes above, meant that it took me a very long time to get anywhere approaching a breakthrough. If you’re writing purely for your own amusement, then it doesn’t matter how wacky and unsellable the results are. And if you’re too obsessed with trying to write ‘to the market’ then it’s likely your writing will lack originality and spark. However, if you want your writing to have a fighting chance of getting somewhere once you’ve finished it, it’s a good idea to have at least a vague idea of what the marketplace looks like and where your work might fit into it, before you get stuck in. Does anyone have their own writing mistakes they’d like to share? I’ve written here before about some of the bad advice writers often get given. Today, I’m going to talk in a little more depth about my least favourite piece of writing advice: ‘write what you know’. Which is, in my humble opinion, possibly the single worst thing you can say to an aspiring writer. I’m going to – ironically enough – answer that question by writing about what I know. When I was a young impressionable lass, trying to get started as a writer, I heard this little gem trotted out repeatedly by a bunch of people (who, in hindsight, didn’t really know what they were talking about). And I found it, quite simply, paralysing. Because I didn’t know anything. When you haven’t yet had the chance to accumulate much life experience or in-depth knowledge, being told to write what you know is the opposite of helpful. What I needed to hear instead was something along the lines of: write whatever comes into your head and have some fun with it. It’s easy to say I should have disregarded this unhelpful advice and found my own path, and yet it was presented to me as such received wisdom that I largely internalised it, to the detriment of my inspiration and motivation. Even later on, once I had some experiences under my belt, I found writing things based on them difficult, and had little success. Partly, I think, it’s a personal thing: some people seem to thrive on more confessional forms of writing, while I just don’t. While I certainly wouldn’t discourage anyone who wants to from using their own life as a source of ideas for creative writing (hey, whatever works for you), I also think there are some broader problems with the ‘write what you know’ mantra. For instance, there’s this brutal question: is your life interesting enough that anyone else would want to read about it? Or are your experiences actually very similar to a lot of other people’s experiences (ie the ones they read books to escape from)? While some authors do have the skill to spin the frustrations of everyday life into fictional gold, many don’t. And even if you do have exciting and unique experiences to write about, there’s another problem: what do you do once you’ve written about them? What comes next? For instance, I loved Caitlin Moran’s memoir How to Be a Woman, but then found her novel How to Build a Girl disappointingly similar (even the title is almost the same! ), and I note she hasn’t followed it up with more novels. There’s also the issue of the nature of real life: it rarely falls into neat character arcs and plot resolutions. Real people and situations tend to be far more messy and self-contradictory than those in fiction. I personally struggled to turn one into the other, or to get enough distance on my own feelings to write about them convincingly. In my case, it was only when I finally abandoned any attempt to write anything based in any way on reality, and plunged instead into the realms of fantasy fiction, that I set my creativity free and I wrote some stories I feel proud of. My current novel, In the Land Newly Risen from the Sea, features a cast of characters including: the captain of a sailing ship, a dragon, a transgender magician, a torturer, and a flying assassin. I have no idea what it’s like to be any of those things, but that doesn’t matter: I use my imagination. And, if need be, I do some research. Which brings me round to how I think this zombie-like piece of writing ‘wisdom’ can be improved markedly: by flipping it. Instead of ‘write what you know’ try this: know what you write. Read extensively, soak up the world, keep an open mind, and if you don’t know something relevant to the tale you want to tell, find out. Most importantly, write what you know you want to write, not what you think you ought to write. I wish someone had told me that when I was younger. Note: my little bundle of joy is due to arrive on the 12th of August, so I may not be updating this blog for a while, but I’ll be back as soon as I’ve mastered the skill of typing with one hand whilst feeding a baby with the other. Last month I reported I’d finished the first draft of my new novel, working title In the Land Newly Risen from the Sea, and was letting it ferment for a week or so before cracking on with editing it. I’m now stuck well into the editing process, trying to get it finished before my baby bump grows so big I can’t reach my keyboard. Ideally, I’ll have it finished by the end of June, and then give myself six months of maternity leave. Of course, things don’t always go quite to plan, so come September I might be trying to type re-writes with one hand while holding a screaming baby in the other. One thing I’ve noticed when I discuss editing is that not everyone has a very firm grasp of what it involves – many people assume it’s simply a hunt-and-destroy for typos. That’s actually proofreading, a separate process which comes later. So if editing isn’t looking for typos, what is it then? Well, the way I think of it is as a three-part process, each part of which involves making a pass over the manuscript and examining it in a greater or lesser level of detail. The first pass is to check for basic consistency, pacing, and structure. Are there any plot holes? Do the characters’ motivations make sense? Does it have a ‘saggy middle’ where the story meanders around without much direction? Are there too many sub-plots? Or, as I’ve found this time round, are we spending too long with one character’s point-of-view and neglecting what’s happening to the protagonist? It’s at this stage that you might decide to make big changes like changing the order of the chapters or cutting out a big chunk of text. The second pass is what I think of as the continuity-error search. In the movies, continuity errors are things like a character’s outfit mysteriously changing when they walk through a door, or objects on a table disappearing between shots. With books, you don’t have to worry about every tiny detail in quite the same way – but you do need to make sure that, if you’ve described a character as finding a knife in one scene, you don’t then have a later scene where the knife has gone missing without any explanation. The third pass is the line edit – this is when you get really down-and-dirty with the details of your word choices, and tinker with your sentences to make them flow better. It’s here that you discover things like an over-excessive use of the word ‘but’ (but I need to use it every other sentence! It’s such a useful word!) or that you’ve described characters as ‘hissing’ lines of dialogue which contain no sibilants. You’re smoothing out the edges of the sculpture, if you want to think of it that way. And yes, if you spot any typos, by all means correct them. Back in January, I laid out my New Year’s Resolutions for 2016. We’re now nearly half-way through the year, so I thought it was time to re-visit those resolutions and do a progress report. My first resolution was to finally finish my novel The Silvergreen Sea. Status: Confident green tick. It’s all done and out on submission as I write these words. Second resolution, to finish the rough draft of my new novel The Tide of Fire. Status: Slightly more wobbly tick, probably in blue ink. It’s done – albeit only to a given value of ‘done’. It’s still nowhere near ready to be sent out on submission and I’m putting it aside for now, to be re-visited later. Third resolution, to read at least 50 books. Status: Firm tick. I have successfully consumed 50 books in various forms – 29 paperbacks, 11 audio books, 5 hardbacks, 4 electronic books, and a graphic novel. All my resolutions are already done, and it’s not even the end of June. I’ve officially won at New Year’s Resolutions. So what comes next – shall I just put my feet up and watch Netflix for the next six months? It’s certainly tempting – the new season of Orange is the New Black has just come out, so that’ll keep me occupied for a few days at least. But after that, perhaps it’s time for some New New Year’s Resolutions. 2016 Part Two, if you will. What’s up next? Well, I’ve started writing a new book, The Only Thing That Never Burns In Hell, so I want to finish that in rough draft. I also want to read 50 more books, to get me up to a nice round hundred for the year. 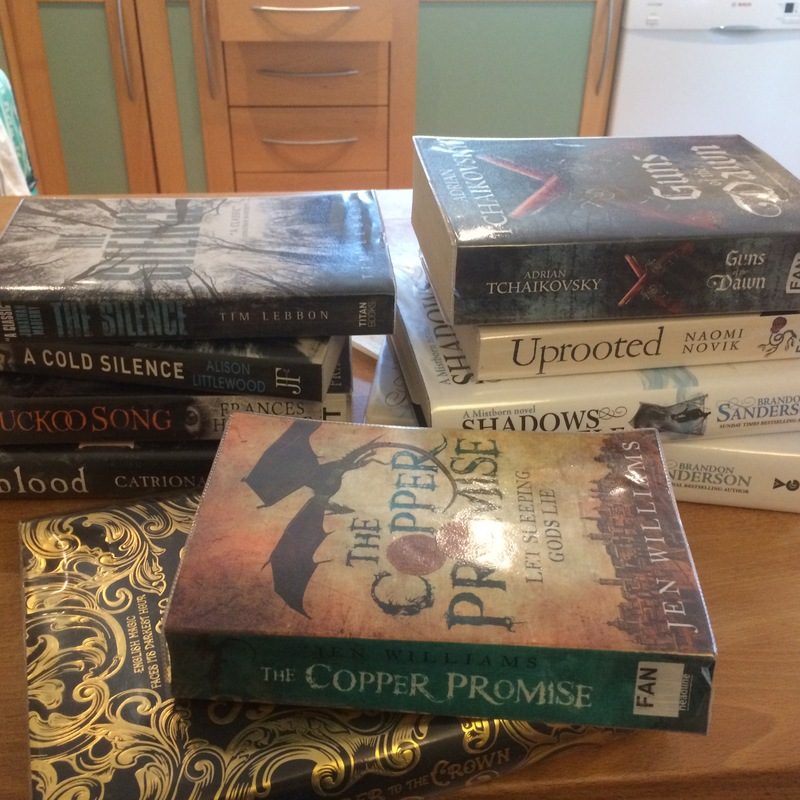 And as part of that I’ve got a mini-resolution, to read all the books which have been nominated for the British Fantasy Society’s Best Fantasy Novel and Best Horror Novel Awards, before they’re given out in September at the convention in Scarborough. I’ve made a start on the winning novels from last year as well – Cuckoo Song by Frances Hardinge, and No One Gets Out Alive by Adam Nevill. The only problem is that they’re both kind of freaking me out. Oh well, New Year’s Resolutions can’t be too easy, can they?